I finally finished the projects I was working on, they're boxed up and ready to be posted to the magazine. Sorry my blog was so quiet this week but I have been working away!! Just can't share the projects with you yet! 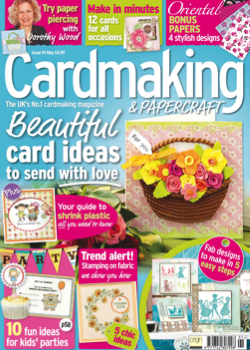 I can share a few cards that I have in the current issue (91) of Cardmaking and Papercraft Magazine (UK). I had to make six cards with different ideas using brads! I had fun doing this one! My fav is the flower pot card, I used some fab crochet embellishments from Annie Design at Etsy. I had a bonus card and tag set in the subscription edition too, I used papers from Papermania Rose Garden, I love those papers! The stamps I used are from Waltzingmouse Stamps. For more details and lots of inspiration check out the current issue of Cardmaking and Papercraft Magazine (UK). I'm off to make a card for tomorrow now!! Last day of pre-school for Isabelle tomorrow, they're on their Easter holidays... not back until the 2nd of May! That reminds me, I haven't had a chance to make a single Easter card yet! Where does the time go to?? So pretty! love the one with the crochet flower. Clare - what a fabulous set of cards - I particularly like the second set of three - the butterfly one is fab! Still you can't go wrong with greens as far as I'm concerned. Just breathtaking, the lot! Nothing like noting a job well done. I am particularly enamoured with the card and tag dynamic duo. So sweet. Here's to a marvellous Easter Holidays! Beautiful cards Clare, saw them during the week when my mag arrived, they are stunning!! I love the fresh and 'spring"look of these cards. And that touch elegance; your style and desgins are stunning!